NASA’s Opportunity exploration rover continues to send images and explore new regions on the Mars. Now in its eighth year on the planet, Opportunity has reached “Greeley Haven” and has traveled a total 21.4 miles during its time on Mars. Scientists hope that by staying on the outer ridge at “Greeley Haven,” Martian winds can clean the dust off the solar panels so Opportunity can move on to Endeavour’s rim. “Endeavour is a window further into Mars’ past,” said Mars Exploration Rover Program Manager John Callas, of NASA’s Jet Propulsion Laboratory, Pasadena, Calif. The trek took three years. In a push to finish it, Opportunity drove farther during its eighth year on Mars — 4.8 miles (7.7 kilometers) — than in any prior year, bringing its total driving distance to 21.4 miles (34.4 kilometers). 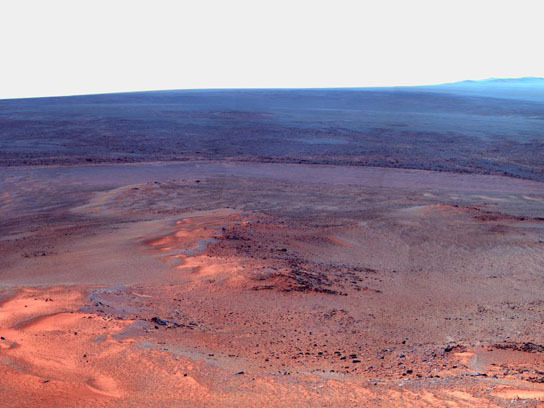 This mosaic of images taken in mid-January 2012 shows the windswept vista northward (left) to northeastward (right) from the location where NASA's Mars Exploration Rover Opportunity is spending its fifth Martian winter, an outcrop informally named "Greeley Haven." The view includes sand ripples and other wind-sculpted features in the foreground and mid-field. The northern edge of the the "Cape York" segment of the rim of Endeavour Crater forms an arc across the upper half of the scene. The “Cape York” segment of Endeavour’s rim, where Opportunity has been working since August 2011, has already validated the choice of Endeavour as a long-term goal. “It’s like starting a new mission, and we hit pay dirt right out of the gate,” Callas said. Mars years last nearly twice as long as Earth years. Entering its ninth Earth year on Mars, Opportunity is also heading into its fifth Martian winter. Its solar panels have accumulated so much dust since Martian winds last cleaned them — more than in previous winters — the rover needs to stay on a sun-facing slope to have enough energy to keep active through the winter. The rover team has not had to use this strategy with Opportunity in past winters, though it did so with Spirit, farther from the equator, for the three Martian winters that Spirit survived. By the beginning of the rovers’ fourth Martian winter, drive motors in two of Spirit’s six wheels had ceased working, long past their design lifespan. The impaired mobility kept the rover from maneuvering to an energy-favorable slope. Spirit stopped communicating in March 2010. All six of Opportunity’s wheels are still useful for driving, but the rover will stay on an outcrop called “Greeley Haven” until mid-2012 to take advantage of the outcrop’s favorable slope and targets of scientific interest during the Martian winter. After the winter, or earlier if wind cleans dust off the solar panels, researchers plan to drive Opportunity in search of clay minerals that a Mars orbiter’s observations indicate lie on Endeavour’s rim. “The top priority at Greeley Haven is the radio-science campaign to provide information about Mars’ interior,” said JPL’s Diana Blaney, deputy project scientist for the mission. This study uses weeks of tracking radio signals from the stationary rover to measure wobble in the planet’s rotation. The amount of wobble is an indicator of whether the core of the planet is molten, similar to the way spinning an egg can be used to determine whether it is raw or hard-boiled. Other research at Greeley Haven includes long-term data gathering to investigate mineral ingredients of the outcrop with spectrometers on Opportunity’s arm, and repeated observations to monitor wind-caused changes at various scales. The Moessbauer spectrometer, which identifies iron-containing minerals, uses radiation from cobalt-57 in the instrument to elicit a response from molecules in the rock. The half-life of cobalt-57 is only about nine months, so this source has diminished greatly. A measurement that could have been made in less than an hour during the rover’s first year now requires weeks of holding the spectrometer on the target. Be the first to comment on "NASA’s Opportunity Rover Continues Research at Greeley Haven"